Transitive Verbs | What are Transitive Verbs? A transitive verb is a verb that can take a direct object. In other words, it is done to someone or something. Most verbs are transitive. A transitive verb contrasts with an intransitive verb. 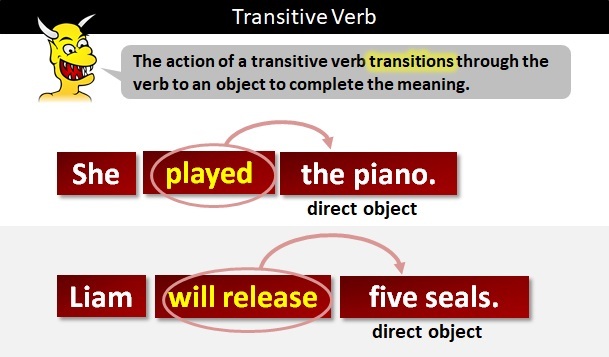 An intransitive verb cannot have a direct object. Remember, to find a direct object of a transitive verb, first find the verb and then ask "what?" (or "whom?"). In each example below, the transitive verb is shaded and direct object is in bold. Lee eats dozens of cakes. Mary saw the eagle two days after it escaped. As the clock struck midnight, all the toys opened their eyes. They arrived after the party. Here are some more examples of transitive verbs. Remember, to prove they are transitive, find the verb (shaded) and then ask "what?" or "whom?" to find the direct object (in bold). You can't get eight cats to pull a sled through snow. The workers protested their innocence in the car park. The workers protested in the car park.